Are you looking for a dependable, trustworthy and professional cleaners in South East London? Are you dissatisfied with the kind of service your cleaning company gives you? Do you wish to have a cleaning partner you can rely on? FastKlean is fully aware of your cleaning needs and dilemmas. Many consumers especially those that have a busy lifestyle tend to look for a company that understands their situation and are open for discussing any of their requests. We work with fully trained, insured and reliable professional cleaners in South East London. We assure our customer’s safety by hiring only expert and honest workers. We usually administer thorough and strict background checks for each of our employees, since we are aware of the risk accompanied by letting a group of people you barely know to enter your premises. We guarantee you that they are all insured and will carry out their tasks responsibly and efficiently. Along with our specialists and honest staff we also provide a variety of quality cleaning services that are specifically made for working out and giving efficient solutions to common cleaning problems. Their effectiveness in cleaning mostly relies on the tools and equipment we use and the cleaning solutions we utilise. Below is the list of some of the affordable and satisfactory services we provide. If you wish to know the cleaning prices of these services, we offer a free instant quote. Office and Commercial Cleaning and many more! We are widely known by the public because of the efficient and flawless services we offer. We operate these services in all areas of South East London. You can look on the list below to find out if we cover your areas. If you have any further questions about our professional cleaners in South East London, you may contact us now at 020 8884 9149 and we will immediately respond to your call. 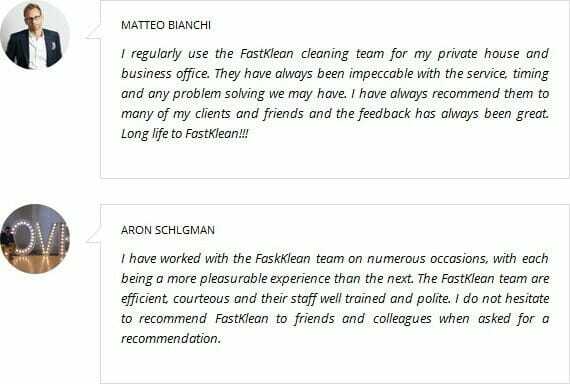 Remember, if you are looking for efficient and quality cleaning services always think of FastKlean.